A day of awesome, or a day of two guys pushing little models around a table, you decide. For those of you who think it sounds awesome, you’re in luck as its time for a playtest report! 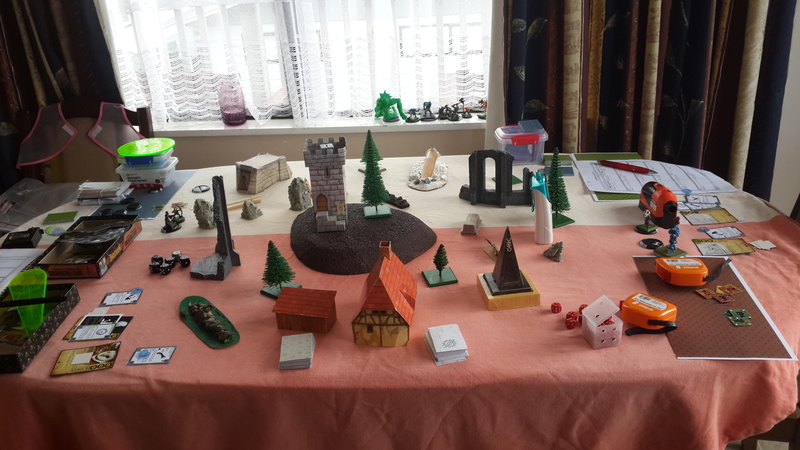 We began probably around 10.30-11am, set up the terrain on Simon’s table while discussing how best to go about testing all the new things we have been wanting to test. We decided to play through our ‘tutorial’ and follow that up with the next few scenarios on the list and call that an Expedition. For us an Expedition is going to be a mini campaign in itself, 2-3+ scenarios one after another without returning to town to resupply or rest injured gang members. It will follow a bit of a story or fluff, to help immerse the players into the game and world. With the plan locked in we then had to pick our first two gang members for the tutorial scenario. The idea with the tutorial scenario is to give those fresh to the game a basic run through of the core mechanics without drowning them in too much information, and as such its easiest to run through the tutorial with fewer models. Wanting to test out the new donderbuss and muskaxe weapons meant that we had to take at least the Two Horn and Wou for a spin. Simon ended up with the Two Horn and the One Horn, while I took the Wou and a Tyton (who I promptly called Vwywn and Tonkerton). Rolling through the tutorial we quickly achieved the object and completed the scenario. We then gained another character to add to our fearless gangs. Simon added a Shrubber called Oscar to his team, mean while an Ophidia called Chaz was recruited to Gilganosh’s Exploratorium (my gang). At this point we had picked up a few items from the Faction Deck in the scenario resolution and we felt the new Faction Decks were working quite well…apart from some minor name changes, and tweaks. Moving on to our next scenario and therefore the start of our Expedition, we selected scenario01 which was conveniently at the top of the list. This scenario is our basic scenario with a bit of searching and a bit of battle all mixed into one. During the battle I believe my Tyton suffered and arm injury and therefore dropped his nice new pistols (curses!). Simon’s Shrubber was a pain the whole game as I could hit the damn thing. And both of us came away with a few pieces of loot each, which boosted our gold or cash at the end of the scenario. 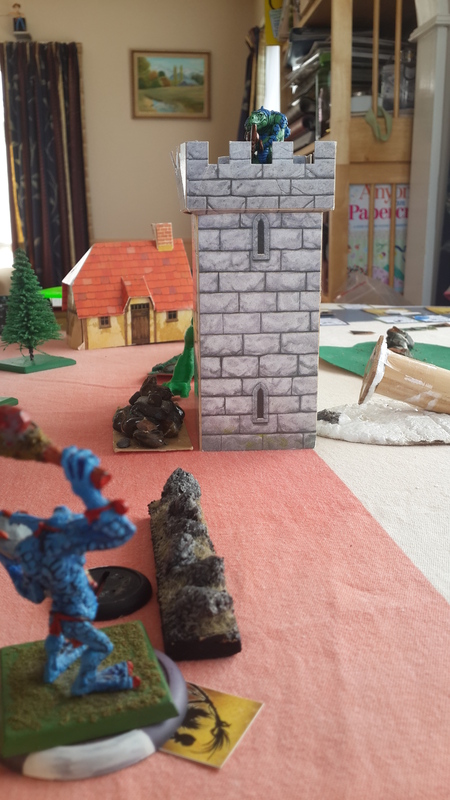 For the scenario resolution we are desperately trying to avoid penalising people loosing too many models or getting beaten too badly but it is never an easy thing to balance, which is why this play testing is important. 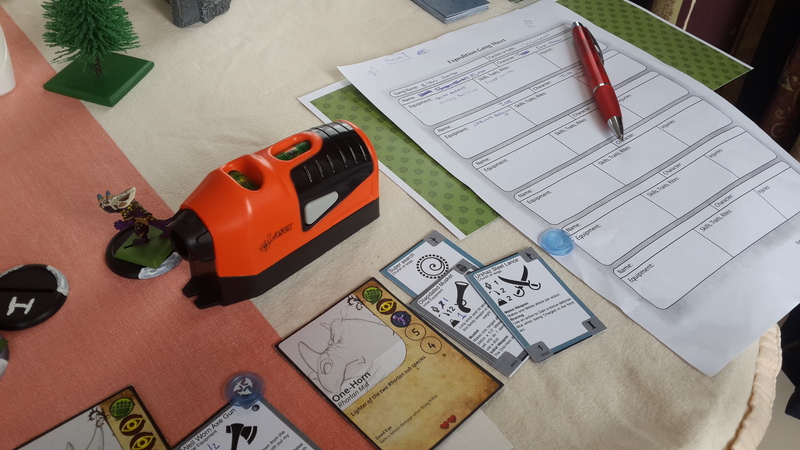 Our third scenario (after much redeveloping on the fly) became a boss battle / finale, and kept us very entertained. It basically involved us searching for a hidden model while avoiding the ‘Tower of the Gods’ in the centre of the table which kept knocking us down. After much battling I secured the hidden model but could not hold on to the relic dropped from the tower. Was an awesome game and the upgrades, skills and trinkets we had acquired leading up to the scenario helped it to feel like a culmination of an expedition. Tower of the Gods! trust me that paper tower was a pain in the backside. At this point we were feeling good and things were rolling along well. Each game had averaged around 1 hour each or there abouts, which feels like a good length for a game. Before starting the next scenario we once again had to rewrite it before we even started it. Despite an early restart due to poor rewriting, the game was feeling good till it got to the last turn and suddenly Simon was out numbered and I didn’t have any reason not to wipe him off the board which felt wrong and very meh. But despite this the game itself was still fun up until that moment, which leads me to believe that it is the scenario which let us down rather than other areas of the game. Small sized cards for the Faction Deck (equipment, skills and abilities) worked really well too.